Blood samples were taken for two successive years from canvasback ducks trapped in the Chesapeake Bay. The first winter (1972–1973) five plasma enzymes known to respond to organochlorine poisoning were examined. Abnormal enzyme elevations suggested that 20% of the population sampled (23/115 ducks) might contain organochlorine contaminants, but no residue analyses were performed. The second winter (1974) two of the same enzymes, aspartate aminotransferase and lactate dehydrogenase, and a third enzyme known to be specifically inhibited by lead, delta-aminolevulinic acid dehydratase, were assayed in 95 blood samples. 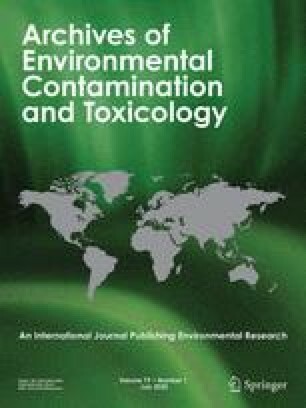 Blood residues of organochlorine compounds and of lead were determined in representative samples, and the correlations between residue levels and enzyme changes were examined. The enzyme bioassays in 1974 indicated that lead was a more prevalent environmental contaminant than organochlorine compounds in canvasback ducks; 17% of the blood samples had less than one-half of the normal delta-aminolevulinic acid dehydratase activity, but only 11% exhibited abnormal aspartate aminotransferase or lactate dehydrogenase activities. These findings were confirmed by residue analyses that demonstrated lead concentrations four times higher than background levels, but only relatively low organochlorine concentrations. There was a highly significant inverse correlation between delta-aminolevulinic acid dehydratase activity and blood lead concentrations (P<0.01), and a weaker but significant correlation between plasma aspartate aminotransferase activity and blood PCB concentrations (P<0.05). It was apparent that delta-aminolevulinic acid dehydratase activity in the blood provided a sensitive and precise estimate of lead contamination in waterfowl. In canvasback ducks 200 ppb of lead in the blood caused a 75% decrease in delta-aminolevulinic acid dehydratase activity, a magnitude of enzyme inhibition that disturbs heme synthesis and is regarded as detrimental in humans.